"pH measuring equipment must be cleaned and calibrated regularly to ensure they are giving the user accurate readings. 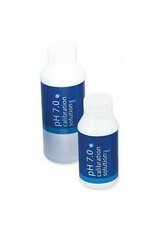 pH instruments are calibrated to pH 7.0 first (buffer) then to pH 4.0 (slope). Calibration Solution should be stored in a cool place out of direct sun and heat. They should be stored with the lids securely tightened."